So … a different format this year. After many of you over the years suggested we wait until the last game (or games, in the case of the opening weekend) of the weekend be played before ranking the best teams, we at The MMQB agreed. This season we’re breaking out the Fine Fifteen section from the “Monday Morning Quarterback” column and running it on Tuesdays. Send us your thoughts about it to talkback@themmqb.com. For Week One: I thought by process of elimination that I’d have the Super Bowl champion Patriots at number one, because there truly wasn’t a premier team through the seven early games on Sunday. New England played well enough in the opener—despite allowing 464 yards to the Steelers—to stake its claim to be king of the hill, but the Denver defense was just too good, the best by far in the league through one week. And so the go-get-’em scheme of defensive coordinator Wade Phillips, along with a few very talented pass-rushers, catapults Denver to the top. 1. Denver (1-0). Just as Peyton Manning (40 passes, zero touchdowns, and when on God’s green earth can you ever say that about Manning?) had one of his most ineffective games as an NFL passer, the Broncos completely shut down Joe Flacco (117 passing yards, 0 TDs, two INTs). Can you imagine if, after throwing 125 touchdown passes his first three seasons in Denver, Manning becomes a complementary player and not the dominant one on his team? He just might be, as long as DeMarcus Ware and Von Miller hit the quarterback eight times, as they did against Flacco on Sunday. 2. Green Bay (1-0). James Jones was Ted Thompson’s gift to Aaron Rodgers. Don’t say the Silent Man never gave you anything, Aaron. 3. New England (1-0). No shame in giving the Steelers 464 offensive yards, I suppose. But this is what I’d be concerned about if I were offensive coordinator Josh McDaniels this week, entering game two at Buffalo: three rookies—guard, center, guard—blocking Marcel Dareus and Kyle Williams. 4. Seattle (0-1). Russell Wilson is now 1-3 in St. Louis. He hasn’t had an easy offensive snap there in four seasons. 5. Baltimore (0-1). 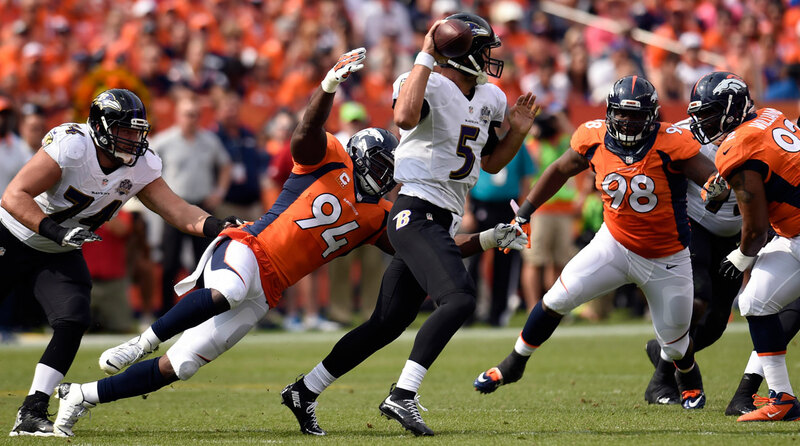 May be naïve, but I think the Ravens can get enough pressure with Elvis Dumervil and Courtney Upshaw to win the AFC. We’ll see if they can, but the Terrell Suggs Achilles injury doesn’t make me change my mind about the Ravens, the same way the Jordy Nelson injury didn’t make me change my mind about the Packers winning the NFC. 6. San Diego (1-0). Really impressed with the Chargers’ scoring 30 unanswered points against a good Detroit team. 7. Kansas City (1-0). With Travis Kelce (six catches, 106 yards, two touchdowns) playing like that, maybe Alex Smith will never have to throw a touchdown pass to a wide receiver for the rest of his life. 8. Buffalo (1-0). Here come the Patriots. Rex Ryan’s frothing at the mouth. If “frothing’’ could include a natural exclamation point, it would, when referring to Rex. 9. Cincinnati (1-0). Bengals outgained Oakland by 150 yards and led 33–0 through three quarters. Perhaps I started shoveling the dirt on Cincinnati too soon. 10. San Francisco (1-0). Biggest lesson of Week 1: Trent Baalke built a deep team in Santa Clara, one that looks like it could—not will, necessarily, but could—survive the loss of Jim Harbaugh. 11. Arizona (1-0). Carson Palmer: 307 yards, three touchdown passes, zero turnovers, zero sacks taken. And you wonder why Bruce Arians loves him like a son? 12. Dallas (1-0). A miracle win, and a bad personnel loss in Dez Bryant (out four to six weeks with a broken foot), and a game at division arch rival Philadelphia Sunday. Why Dallas here? In Romo I trust. 13. Atlanta (1-0). Might have gotten a little lucky at the end of the game, with Philly’s Cody Parkey missing a 44-yarder wide right that would have given the Eagles the lead. But the rejuvenated Falcons defense was something to see. Dan Quinn looks like the right man for that job. 14. Philadelphia (0-1). An abysmal secondary could doom the Eagles. Byron Maxwell, the $63 million man, was awful in Monday night’s 26-24 loss in Atlanta. 15. St. Louis (1-0). There’s a reason why the Rams fought to get all those high draft picks. The reason has something to do with Michael Brockers (round one, 2012) and Aaron Donald (round one, 2014) smothering the interior of the Seattle offensive line Sunday. (Not really. There is only one voter. But each week, I’ll give you the next five.) In order: Pittsburgh (0-1), Miami (1-0), Carolina (1-0), Indianapolis (0-1), New York Jets (1-0).